I'm quite a fan of Italian food. But breakfast isn't really a strength. Apart from coffee and bomboloni, it's slim pickings at the start of the day. Then again, who's gonna complain about a big fat custard donut and a creamy cappucino first thing in the morning? Not me. Problem was, Nick's - 207 Queen Street, Melbourne, Tel +61 3 9670 4506 - didn't have any bomboloni, and the coffee was really quite average. So I took a risk and ordered some eggs. 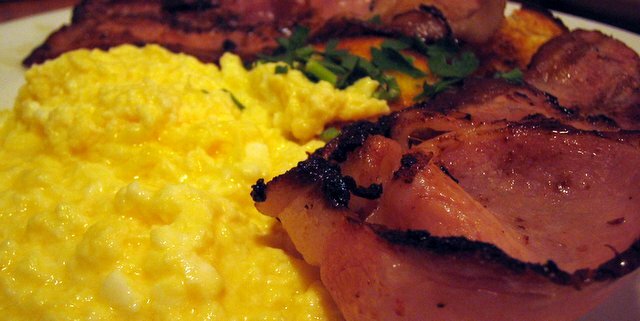 To my surprise, the scrambled eggs were pretty good... nice and creamy without being too rich or wet. The bacon was good too. And for six (or maybe eight) bucks, it was pretty good value. As for the rest of the menu, it seems that Nick is rather fond of ham and cheese. There's a Spuntino Grill with ham and cheese; an omelette with ham, cheese and tomato; ham and cheese on toast; and a ham and cheese croissant... Franco-Italian fusion food, anyone? Without the lunchtime crowd of suits and lawyers, breakfast at Nick's is a bit of a sterile experience. Take away all the people and you start to notice the 70s pine furniture. Retro. Like a good little customer, I placed my order at the bar, paid my $17.50, and settled into a table by the window. $10.50 for the benedict. $4 for a hash brown. $3 for a coffee. The coffee (Vittoria) came very quickly, and was OK. The eggs arrived soon after. The first thing I noticed was a large blob of blood and veins in amongst the ungrilled slices of ham. Not a good look. Once removed, I was able to enjoy the rest of the dish, although the eggs were quite soft and the hash brown quite heavy and greasy. There was a bit of separation going on with the hollandaise, too (but the flavour was good). The menu at the Point is short and sweet. Apart from eggs benedict/florentine/salmon, there's toast, fruit, muesli, berry pancakes, and a "big breakkie" of eggs, etc. I particularly liked the sound of the "roasted field mushrooms, roasted capsicum, Tarrago goats cheese, toast and soft herbs." A strong selling point for this place is its ability to handle Melbourne's "dynamic" weather. On a nice day, there are plenty of outside tables to choose from. On a rainy day, the indoor seating will keep you dry. And on a day like today, when the mercury is racing towards 43 degrees (that's about 109 old-speak), the Point is a beautiful haven of air-conditioning. It was stinking hot in Melbourne today. 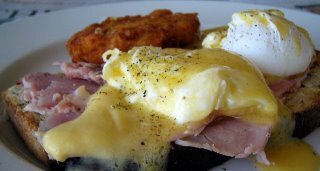 But somehow they managed to serve cold eggs benedict at the Middle Brighton Baths Cafe, 251 The Esplanade, Brighton, Tel +61 3 9539 7000. And they hard-poached the eggs. And they barely toasted the bread. And they didn't grill the ham. At least they did a nice side of sauteed spinach. To be fair, my scrambled eggs with bacon and mushies was pretty good, and the toast was Phillipa's honey whole-wheat. 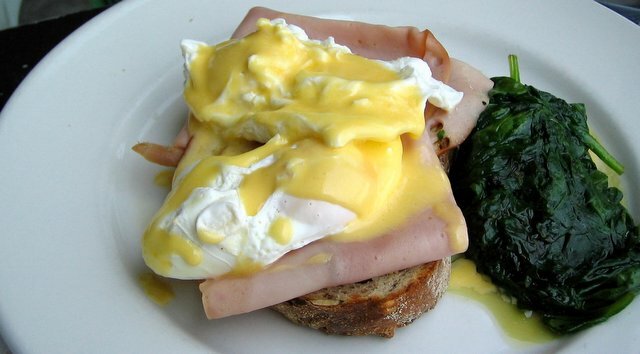 But the poorly poached eggs dragged the whole experience down, and not even the spiffy sea-side view could rescue it. The Baths menu is pretty short and simple: eggs and extras; bircher muesli; fruit salad; ham and cheese croissant; muffins; danish pastries; and toast. Cafe Segovia, Block Place, Melbourne, Tel +61 3 9650 2373. For lunch and dinner, it's Maria Sharapova. The complete package. For breakfast, it's more like Anna Kournikova. Nice looks, but not really a contender. I ordered a serve of Eggs Milanese, hoping for a cross-court winner. Unfortunately, it sailed wide. The scrambled eggs had been cooked just right, with just a touch of softness, but the addition of caramelised onion and parmesan seemed to give the dish a strong eggy flavour, which didn't work for me. I was also disappointed with the side of roasted tomato, which was under-cooked and hard. The bacon and toast were fine. I must admit, I did have high expectations for this morning's breakfast. Segovia is, after all, where it all began for the Nick Bollettieri of the Melbourne cafe scene, Con Christopolous. Since then, he's had his fingers in Degraves, European and Benito's, to name a few. All great venues. So I'm inclined to give the Segovia breakfast another shot. It would be a shame to see a champion go down on a dodgy line call. Did I mention that the Australian Open is on right now? Who'd have guessed. Got half an hour to spare before your Directions Hearing in Court No 1? How about a serve of Eggs Florentine at Illia Cafe, 180 William Street, Melbourne, Tel +61 3 9640 0422. Right next to the Supreme Court. Maybe grab a latte for the Judge on the way out? They really do an excellent hollandaise at this place. Light and bubbly with a real lemon kick. 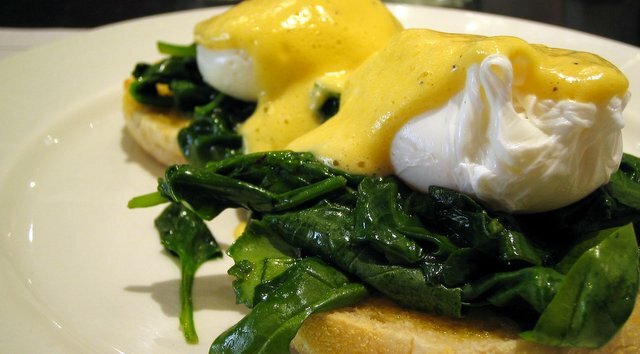 The poached eggs and spinach were very good too. My only complaint was the muffins, which were only lightly toasted... not enough crunch for my liking. If sweet things do it for you, the French toast with plums, pistachios, clotted cream and maple syrup sounded pretty good. They also do porridge with your choice of banana, poached pears, honey, and coconut milk. 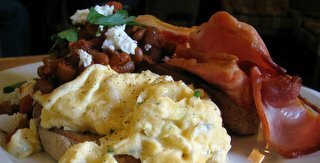 Other savoury options include: Illia Araldo, comprising 2 fried eggs, bacon, cheese, tomato and house made BBQ sauce on Turkish toast; house made vegetarian baked beans on toast; and the usual eggs plus extras. As a venue, Illia is modern yet cosy, with a red glass feature wall and green tiles perking up a room of dark tables and chairs. Good Grinders coffee and friendly service too. God knows what I was doing up at 6.30 this morning. But I was. So I treated myself to breakfast at the Mess Hall, 51 Bourke Street, Melbourne, Tel +61 3 9654 6800. Not only were the eggs very good, but the salt had come all the way from Sicily... Iblea sea salt. Accept no substitute. Actually, I couldn't give a rat's about the salt, but the scrambles were good. Buttery not greasy. 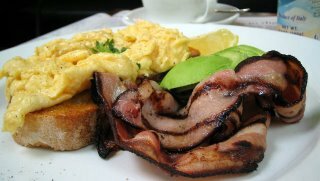 I was also impressed with the bacon, which was finely sliced and flame grilled, and a perfecly ripe side of avocado (with lemon). Hard to fault. The Mess Hall is simple and stylish. Simple food: crumpets with honey; bircher muesli; French toast; eggs and bacon. Stylish venue: white walls; timber floors; rustic 2nd-hand chairs. Good service too. Relaxed but efficient. Greasy Joe's - 68 Acland Street, St Kilda, Tel +61 3 9525 3755 - has got its mojo back. It's bigger than ever (they've annexed the place next door). The vibe is good. And you'll struggle to find a better fry-up anywhere in town. My breakfast with "the lot" was a hearty feast. The "triple bypass breakfast" may well kill you. Three eggs, three snags, three bits of bacon, three hash browns, fried onions... and a porterhouse steak. BYO defibrillator. Back in the 90s, during a brief period of exile in Canberra, GJ's was one of the Melbourne experiences I missed and craved the most. The thought of parking myself in a booth for a lazy 3pm Saturday brekky of eggs benny made me wonder what I was doing in a freezing wasteland where they served lattes in poncy tall glasses with stems. Then, in more recent times, I had some dud experiences, and I feared that old school Joe's was dead (or suffering from serious heart problems). After today, I fear no more. GJ's is back. The food is as good as ever, and the kooky but efficient St Kilda staff are on the job. One of the waiters (a bloke) looked like a cross between Nicole Ritchie and a roadie... skinny black jeans and sneakers with a super-size pair of pink sunnies. Very fetching. The only let-downs were the button mushies (too wet) and the hash browns (too soggy). Otherwise, the eggs were superb, the meats tasty, and the Grinders coffee excellent. It's a wonder anyone ever eats at Cafe Rosamond, rear end of 191 Smith Street (enter from Charles Street), Collingwood, Tel +61 3 9419 2270. First, you have to find the place, which is no small challenge given the lack of signage. Then, there's a giant killer tape-worm wall mural designed to scare you off. And finally, a less-than-welcoming staff do their best to make you feel like an intruder. But if you make it past these defensive measures, the breakfast ain't half bad. 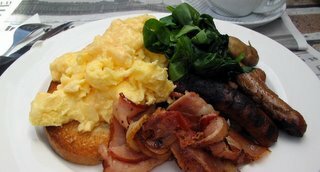 I had a very good serve of scrambled "Kangaroo Island Free Range" eggs, which were just soft and very lightly flecked with chives. The side of house-made baked beans was also very good, served on crunchy sourdough toast with a few crumbles of fetta. The weak links were the bacon, which was OK, but under-grilled, and the lack of condiments. If you decide to take the low-service road (which Rosamond does, with no table orders and almost no table service), then maybe you should stick a bottle of HP on every table. I'm not about to go schlepping across the room begging for sauce once the food has arrived. Maybe I was unlucky, but my experience was a million miles from Matt Preston's claim that Rosamond is "welcoming and unpretentious". The venue may be "old Fitzroy" and the furniture the spoils of a big night of dumpster-diving, but I found the place both unfriendly and quite pretentious. Too much contrived quirkiness. A poseur in vintage gear is still a poseur. The menu stretches from classic cafe to retro. There's a touch of 70's tuck shop thanks to hot jaffles filled with spaghetti and cheese, banana and nutella, or bacon and banana. There's cinnamon toast, muesli, porridge and croissants. 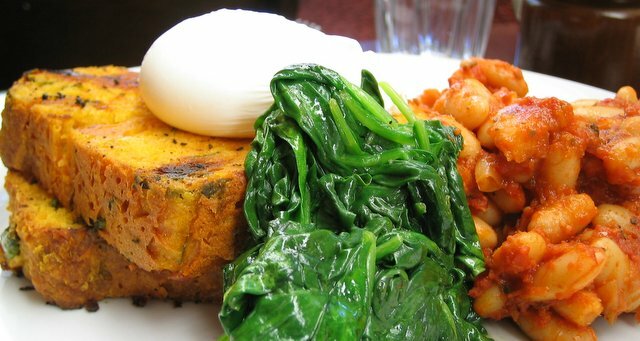 Or for something more exotic-sounding, there's baked eggs with chorizo, corriander and broad beans, or with asparagas, spinach and "special sauce". Mysterious. I save my final comment for the coffee. Once again, where Mr Preston's coffee was particularly good, mine was particularly average. And since we're talking Genovese (normally excellent), and the coffee-guy is said to have worked at Genovese for 7 years, it's all the more surprising that my cappucino was over-filled, under-frothed, and borderline weak. How embarrassment. 11/20 "banana and nutella jaffles"
This morning, in what can best be described as a disappointment, I had eggs benedict at Brown Sugar, 25 Block Place, Melbourne, Tel +61 3 9639 7577. It was my intention to do brekky at Segovia, but just my luck, they were closed for renovations. Brown Sugar was the fall-back option. Two doors down the Block Place strip. It had potential. The specials menu, for example, was anything but dull. Scrambled eggs with fetta and sun-dried tomatoes on toasted Turkish bread. Or bacon curls and grilled tomato on Turkish toast with a balsamic reduction. And the coffee was good. But the benedict turned out to be a try-hard failure, with a big fat wedge of Turkish bread playing host to un-grilled ham and a pair of hollandaise-soaked eggs that were quickly rolling around the plate. To be fair, the poached eggs were nice and round, which tends to imply quality and freshness. But one was slightly under-done and the other slightly over-done. The other problem was the side of hash browns which, despite being house-made, were extremely salty. Way too salty for my taste. It's a nice venue, all dark wood and low light, and the service was pretty good. But why eat here when Bistro d'Orsay is only a few minutes up the road? The Las Chicas crowd - 203 Carlisle Street, Balaclava, Tel +61 3 9531 3699 - has turned designer-scruff into high performance art. Do I wear the beaten-up Birkenstocks with my three-quarter cut-off combat pants? Or maybe the cammo thongs show off a bit more of the Portsea tan? Nah... can't mix combat and cammo... better stick with the sandals. And my white Fred Perry polo. Is that gonna clash with your outfit, babe? You're wearing the black Sass n Bide slouch shorts, yeah? But don't let the cool kids scare you off. This is breakfast paradise. So many good options your head will spin. And we're talking some serious Linda Blair action. I'll start with what we had. My Baked Bean Brekky came with arguably the best bread I've ever had: two thick slices of warm, soft, pumpkin and polenta bread, topped with a poached egg. On the side was a tasty serve of the house baked beans, and a generous pile of spinach sauteed in butter. Delicious. We also tried the BBB, aka Bikini Blowout Benedict. A creative Benedict mutation, it was served on bagel toast (which we switched for sourdough multi-grain) with a layer of avocado and crispy bacon. 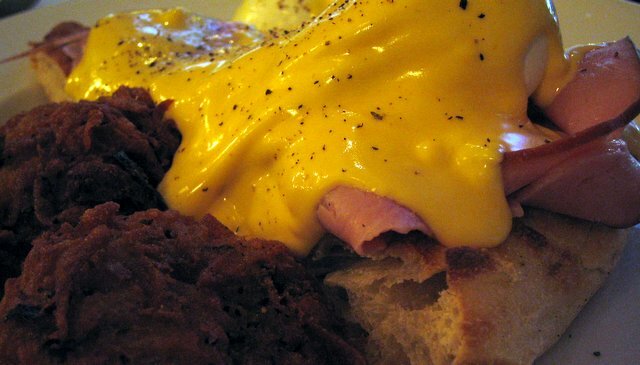 Very good poached eggs and a thick blanket of hollandaise made this another excellent combo. As for the rest, I don't know where to begin. Here's just a sample: French toast or pancakes with fresh banana, strawberries, pistachio ricotta and maple syrup; brekky bruschetta of scrambled eggs, smoked salmon, spinach and pesto sprinkled with pine nuts; roasted field mushrooms topped with a fresh rocket, goats cheese and roasted tomato salad, drizzled with an olive tapenade and lemon dressing; egg & bacon sandwich with hollandaise and rocket on toasted pide. And on and on it goes. Not only is the food excellent (and cheap), but the venue is buzzing off the charts. A long skinny layout, the place has a tight combination of small-medium tables snaking past the coffee bar and kitchen, and a dog-friendly courtyard out the back. Skylights running the length of the building create a light, upbeat feel. Good tunes on the CD player too. 18/20 "mmm... pumpkin and polenta bread"
This morning we achieved the impossible. We booked a table for breakfast at The Bot. I know this because when I asked for our table, I was told "we don't do breakfast bookings". Hmmm... then why did someone take a booking last night? Oh... that's odd... you do have a booking. How did you manage that? After a short wait, they managed to boot some other poor sod off our table and ushered us inside for what turned out to be a great brunch. I went the full woody, otherwise known as the full wood-roasted Botanical breakfast. 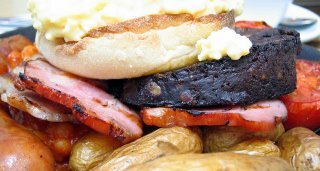 Served on a hot iron plate, this monster-truck of breakfast includes cheese kransky, smoked bacon, baked beans, black pudding, roasted tomatoes, field mushrooms, roasted kipfler potatoes and a toasted muffin topped with eggs (scrambled in my case). The back pudding was probably the highlight, with a funky taste and almost fibrous texture. I think it was made with barley and walnuts... and fat and pigs blood, of course. A rare treat. We also tried the salmon benedict which was almost too perfect for words. The poached eggs had been carefully trimmed and groomed like a pair of prize poodles, and the hollandaise was neatly flecked with just the right amount of salmon roe and a hint of chives. Pretty as a picture. To wash it all down, I had a glass of the 2004 Delas Viognier. Excellent. Viognier may well be my new favorite wine. That, and Petit Verdot.